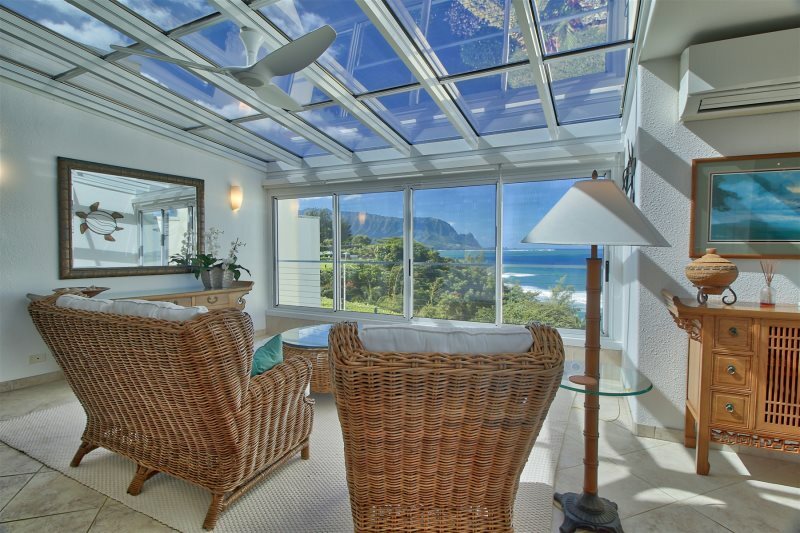 Pu'u Po'a Unit #212 in Princeville, Kauai, has unequaled views and a remodeled elegant, open and airy, bright interior making it unquestionably one of the best and most luxurious condos at Pu'u Poa. With an enclosed atrium, there is an additional sitting room with a sofa and chairs to relax inside and enjoy the view of Bali Hai. The new air conditioning will keep you cool on the hottest days. Our unit has an extra living room window overlooking the ocean that no other unit has added. 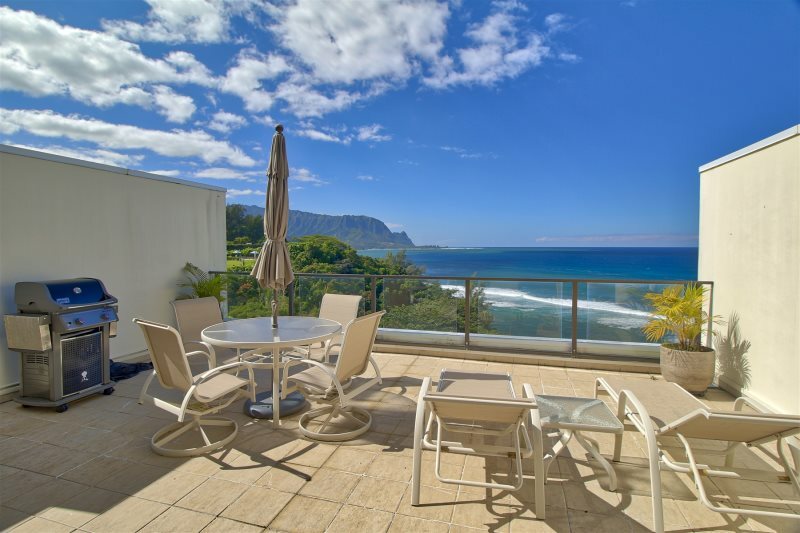 An end unit with huge windows on two sides, this condo commands spectacular views of the famed Bali Hai cliffs, the ocean, whitewater, coral reef below, and Queens Bath. 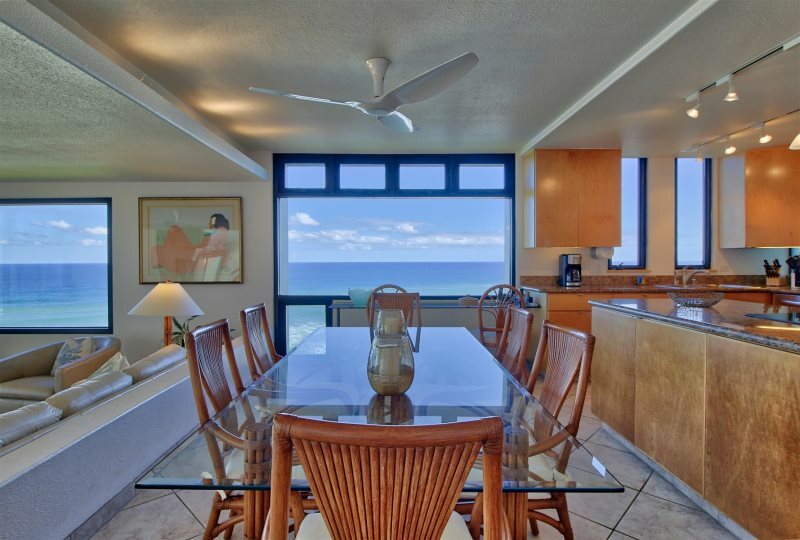 From the living room, dining room, den, and kitchen there's a 260-degree ocean view - like sitting on the bridge of a ship with water all around. 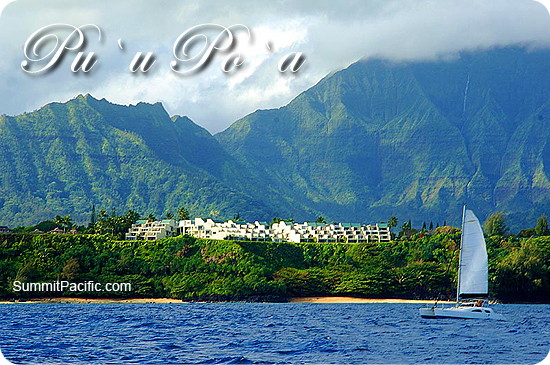 This is the perfect location for a romantic honeymoon or for two couples vacationing together. 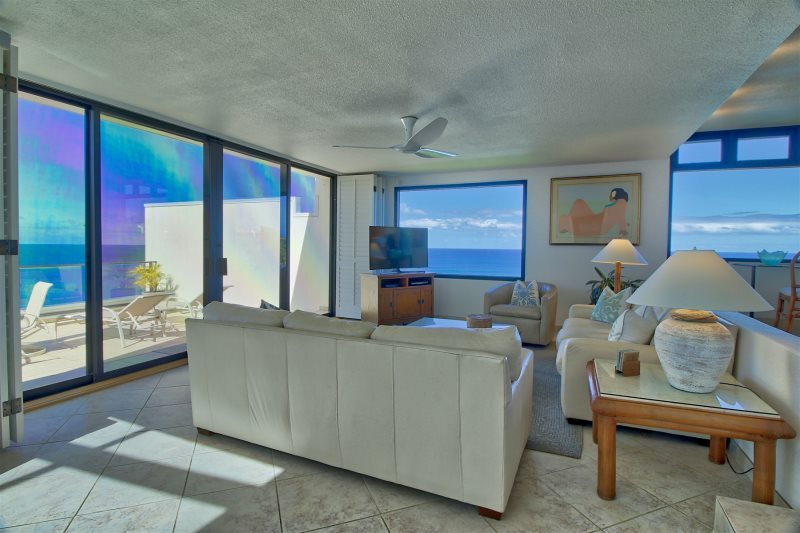 Every room in this elegant 2000 square foot condo has an ocean view. 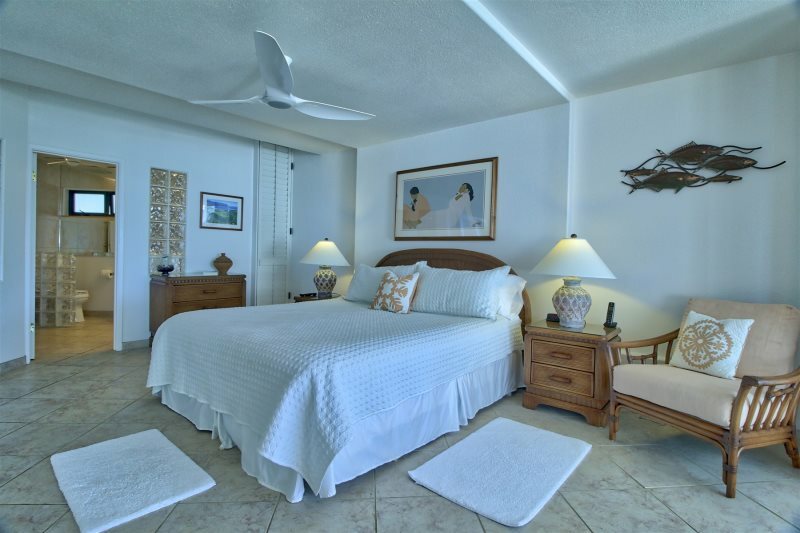 There is a large patio with gas BBQ, two large master bedroom suites each with its own ensuite bathroom, a large living room, a solarium/den, fully-equipped kitchen, dining room, along with ceiling fans in each room. 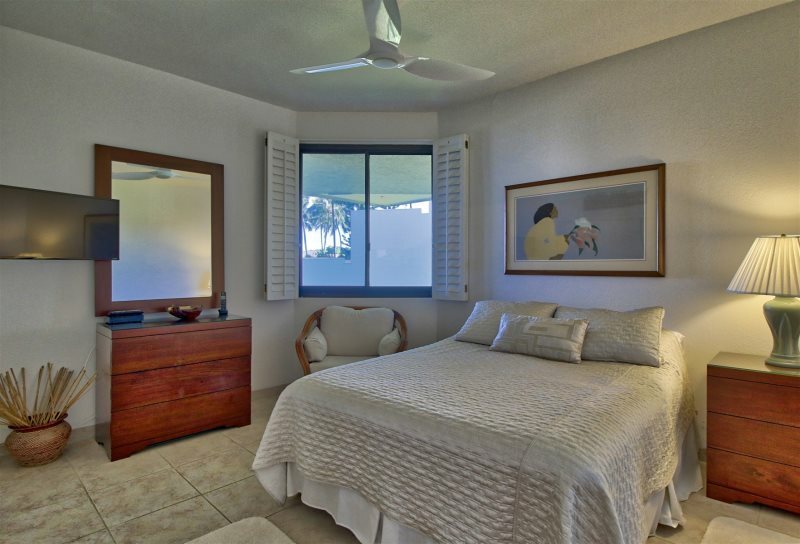 The master bedroom has a king-size bed and overlooks the ocean and Bali Hai. 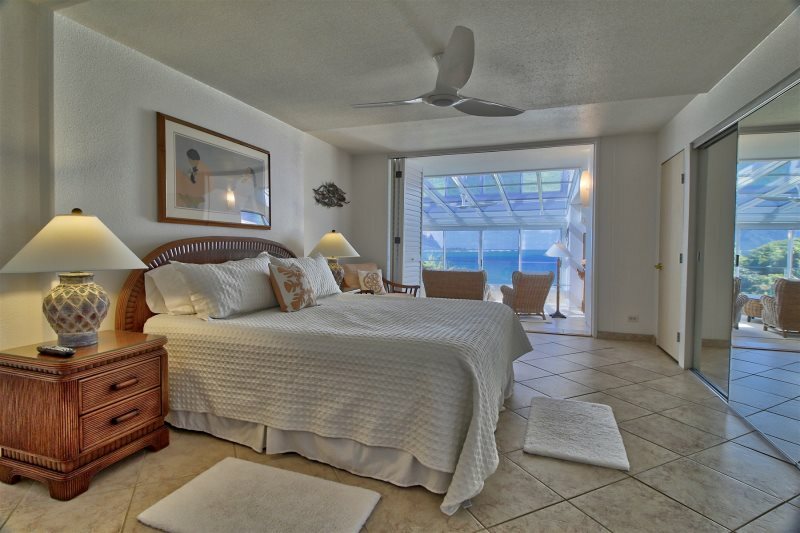 The second bedroom has a queen bed and also has a water view. 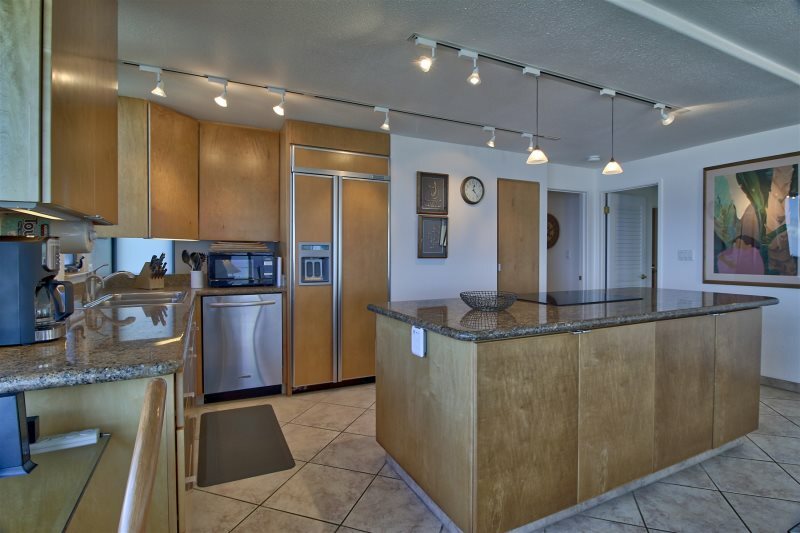 The condo has all new kitchen appliances, a fully-equipped kitchen complete with every gadget you might want, and a new washer/dryer. 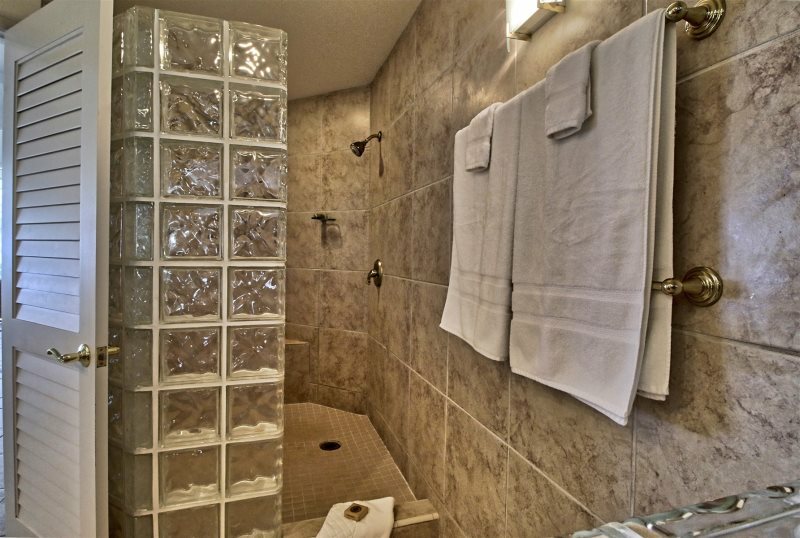 Premium linens and towels are included. There's cable TV with 3 flat screen TV sets, VCR, CD, phone, high speed DSL internet connection, answering machine, microwave, plantation shutters throughout, and more. 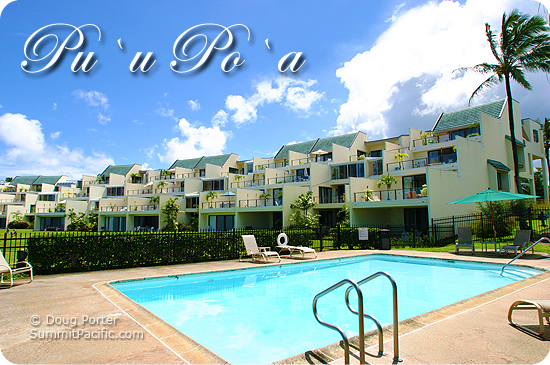 Onsite is a tennis court, a swimming pool, and a path to the beach. Next door (but out of sight) is the magnificent St. Regis Hotel for restaurants, shops, and entertainment. Whales migrate past and are visible from the windows on both sides--north and west--from December through April. Watch them breaching, playing, training their young from the comfort of the kitchen, dining room, living room, lanai, and den. And, when the whales aren't passing, you'll see schools of dolphins and countless sea birds including albatross, frigate birds, etc. 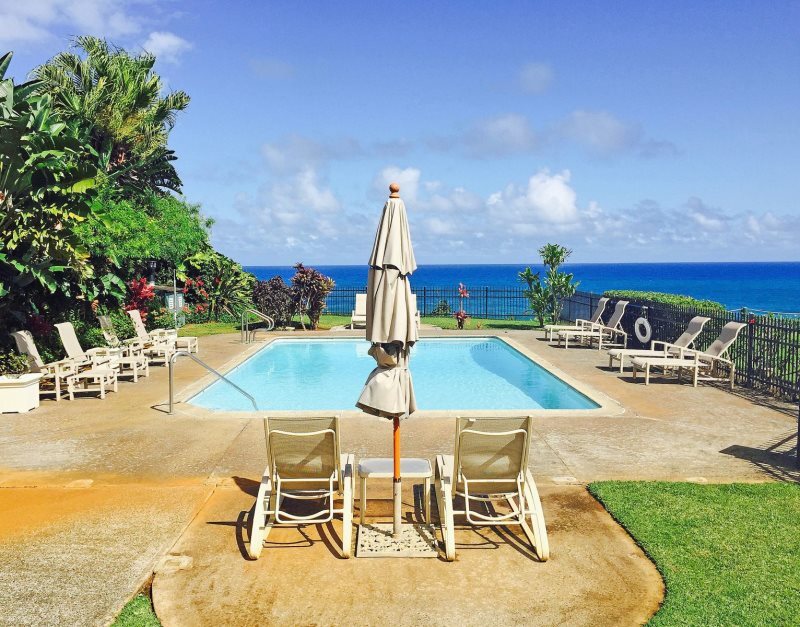 Princeville is the perfect setting for your vacation. 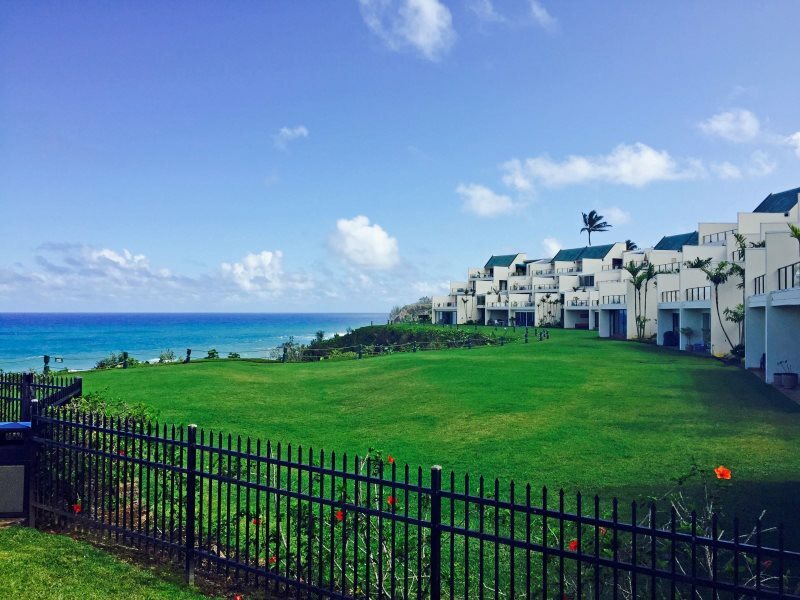 In addition to the 21 hole Robert Trent Jones, Jr. designed Makai Golf Course, nearby are beautiful beaches for swimming, snorkeling, scuba diving, surfing, kayaking, and body surfing. 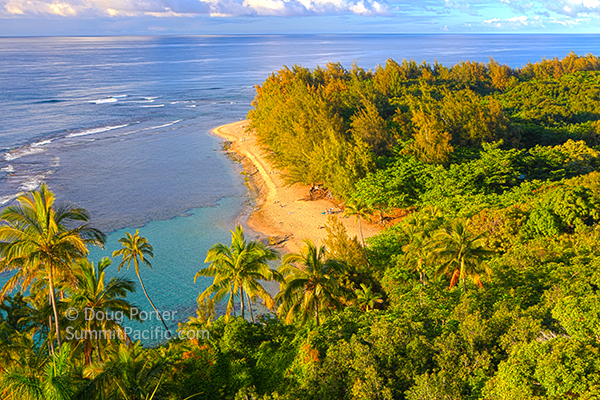 There are trails for walking and bike riding through Princeville, and for hiking at the nearby Na Pali Coast. 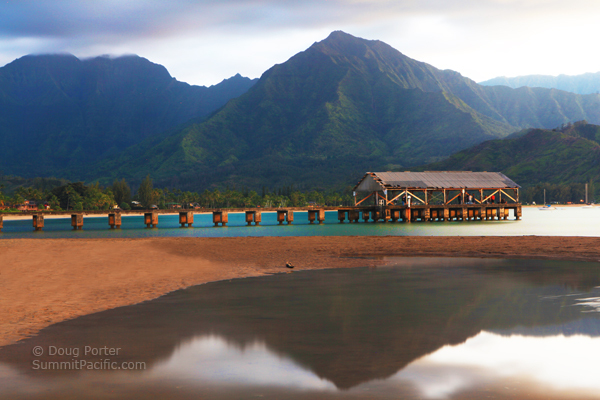 There's shopping and restaurants nearby in Princeville and Hanalei. 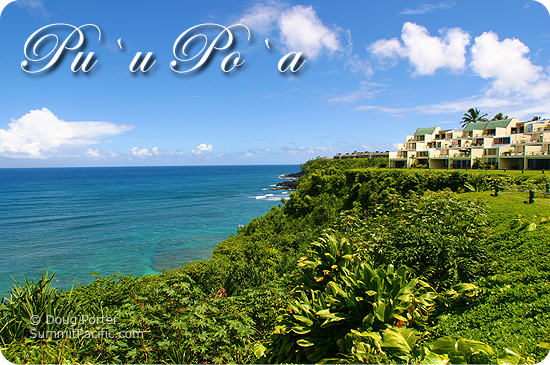 You'll be in heaven sitting on the terrace watching the sunset into the ocean with Bali Hai as a backdrop! 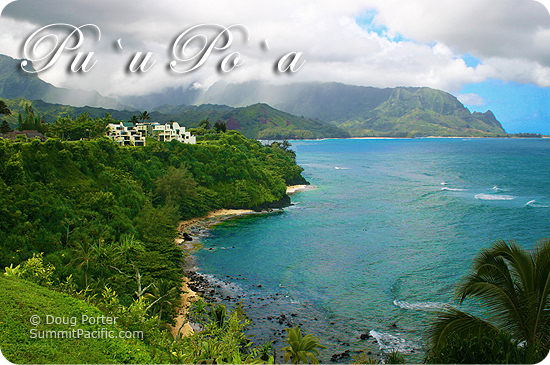 Kauai's spectacular North Shore beaches and coast were made famous in the movie South Pacific, and the north shore is frequently the setting for movies due to the magnificent scenery. 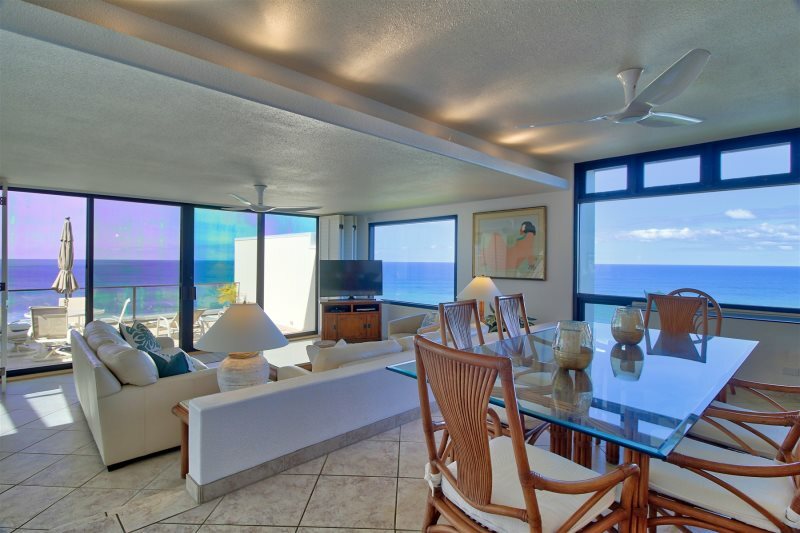 No one has ever been disappointed, and our guests return year after year to this condo. 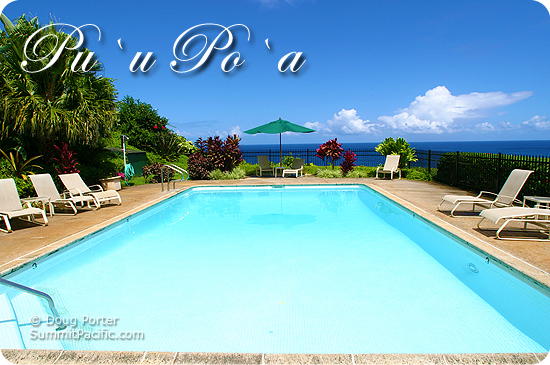 Pu'u Poa Condominiums feature a cliffside swimming pool for your enjoyment, as well as the on site hot tub. Tennis anyone? 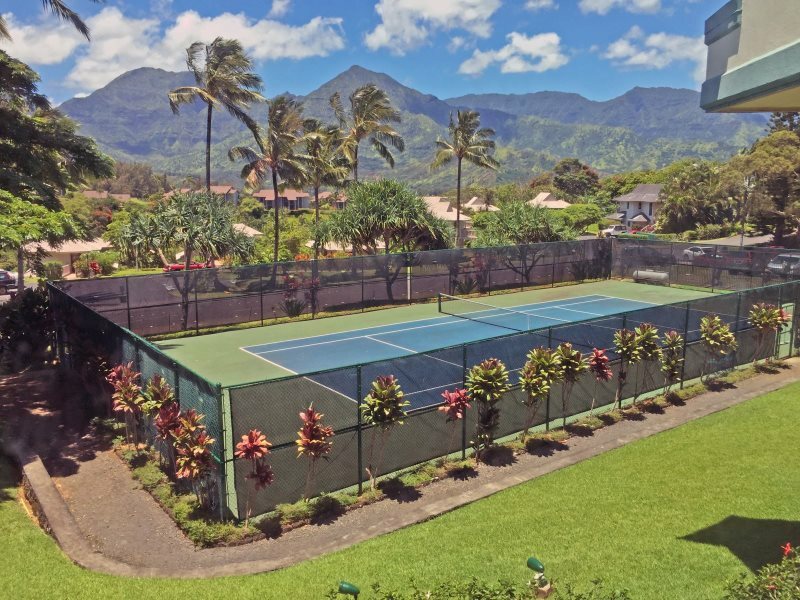 Yes, there is even a private tennis court for your use. 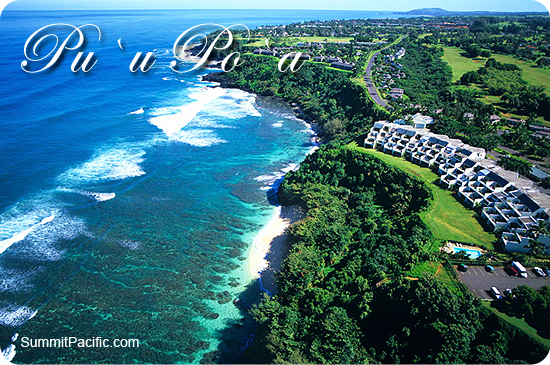 Nearby are restaurants, multiple beaches, walking and jogging paths, golf courses, shopping, etc. 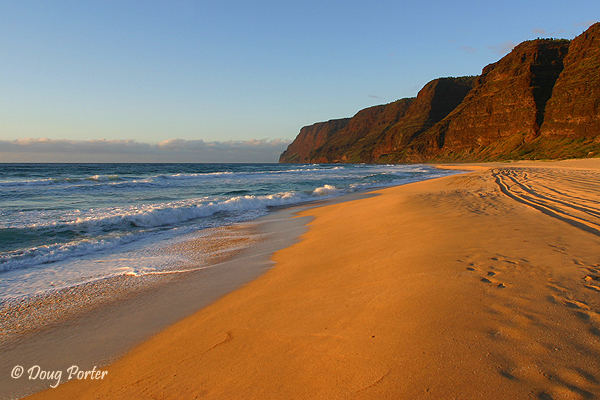 This is your complete tropical hide away vacation! Great location with amazing views. Well-stocked kitchen. 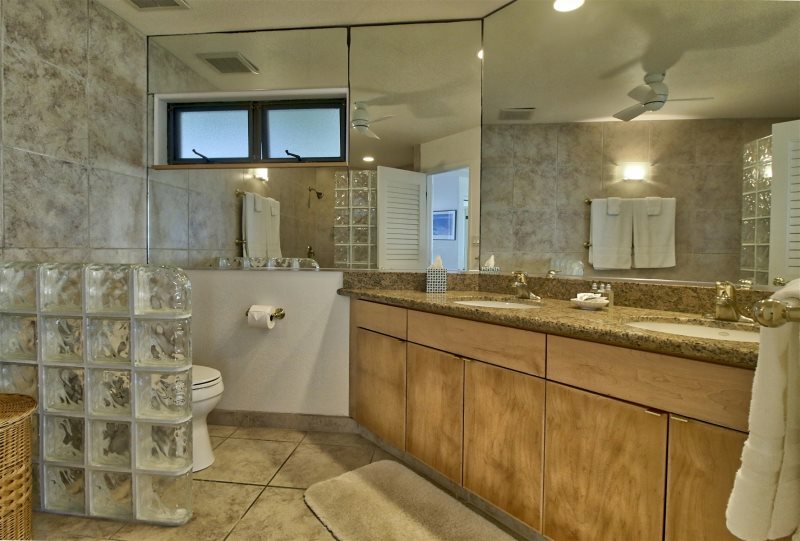 A beautiful comfortable home for your enjoyment and pleasure. What a wonderful place! 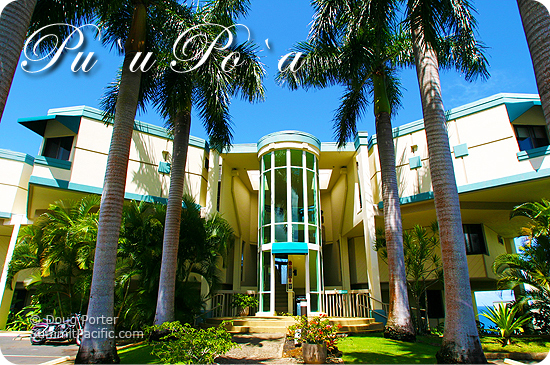 The place is so well appointed, we had absolutely everything we needed and wanted in this unit. The views are spectacular! Binoculars are provided, too, to get an even closer view of wildlife in the water! Staying here for 5 nights was truly a perfect vacation for us. We are adventurous so we loved the climb down to the beach for snorkeling which was terrific at Hideaways. We had quick response when we reached out to our hosts about a minor issue with the ice maker. We wouldn't hesitate to book a stay here again. Just hope its not a long wait! WOW! 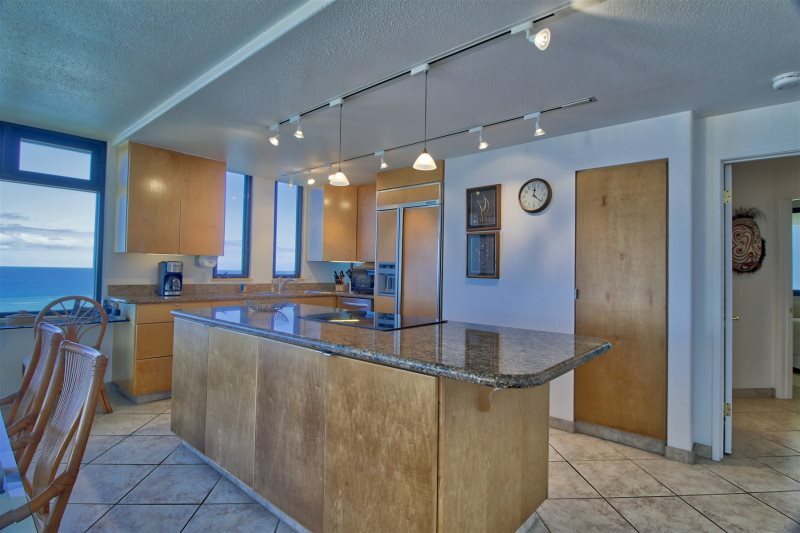 This condo is fantastic. 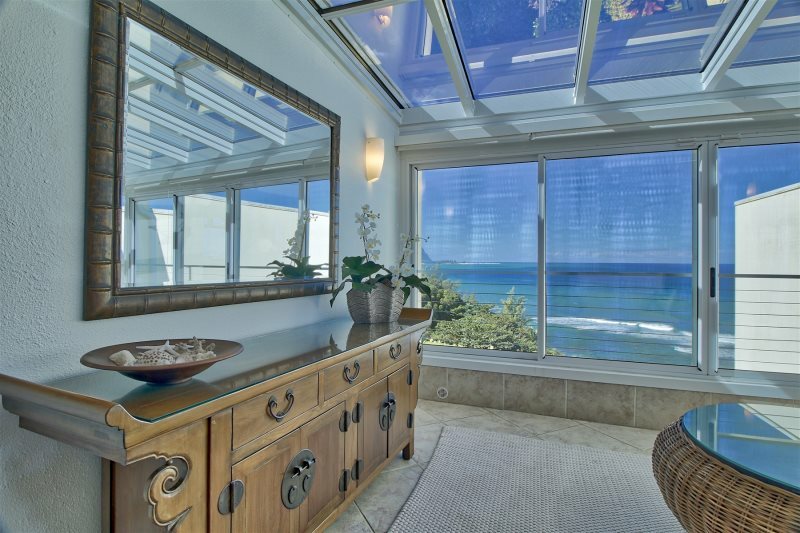 The spectacular ocean views alone are worth every penny. Plus, the condo is private (people can't see in! 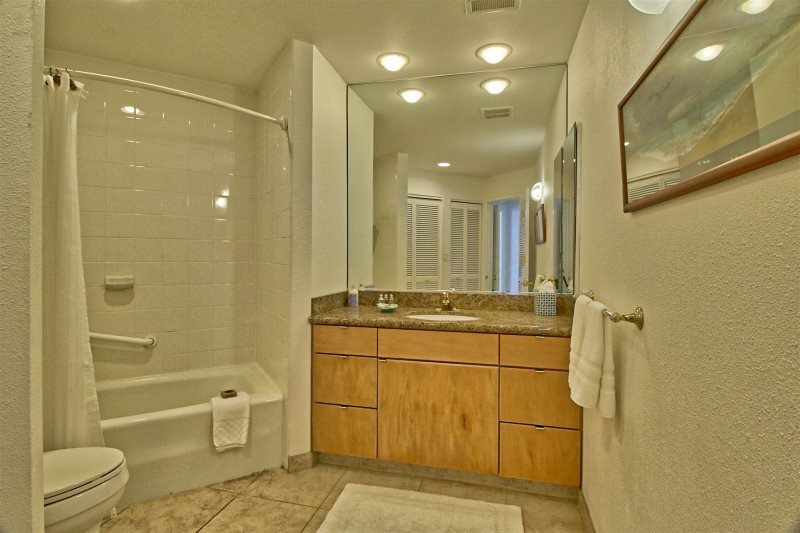 ), modern, and the amenities are spot-on. AC for my wife and I was a must, and it worked perfectly. Same with the high-efficiency clothes washer and dryer. The condo's guidebooks led us to some majestic spots: snorkeling at Hideaways right below the condo's bluffs and the Queen's Bath. 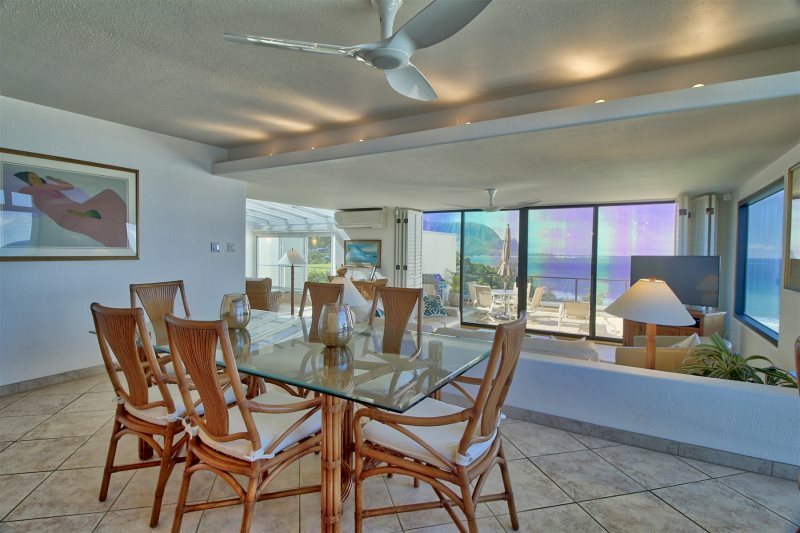 This condo is super special: we spent every breakfast and most lunches right here, enjoying the beautiful views. We hated to leave and hope to come back! Thank you! Such a great place to stay! We stayed while the weather wasn't the greatest, but still waking us to the view of the ocean was amazing. Thanks you. Hope to return soon!! 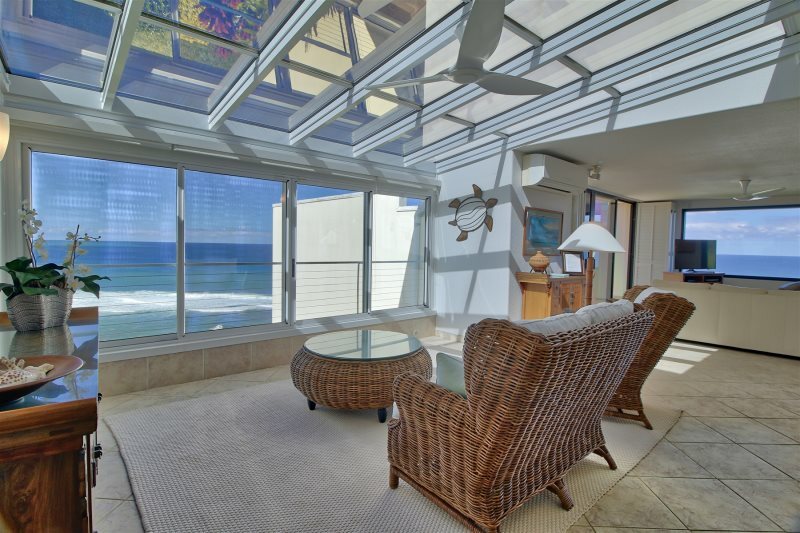 The views from this corner condo were incredible! We had never splurged on a place like this before but it was well worth it. The place was very private and comfortable for 2 couples. 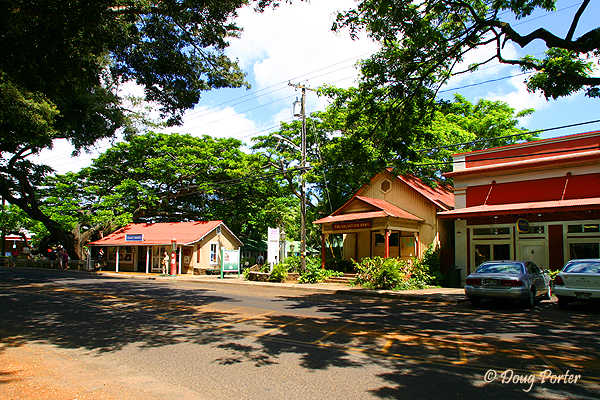 It is not walkable to town but with a car you can reach the charming town of Hanalei in less than 10 minutes. We were here for 6 days in the end of January and did not need the a/c. It was very comfortable. We visited the entire island from this spot and would do it again. What a great place! We had such a wonderful stay in this beautiful condo! You can't beat it! 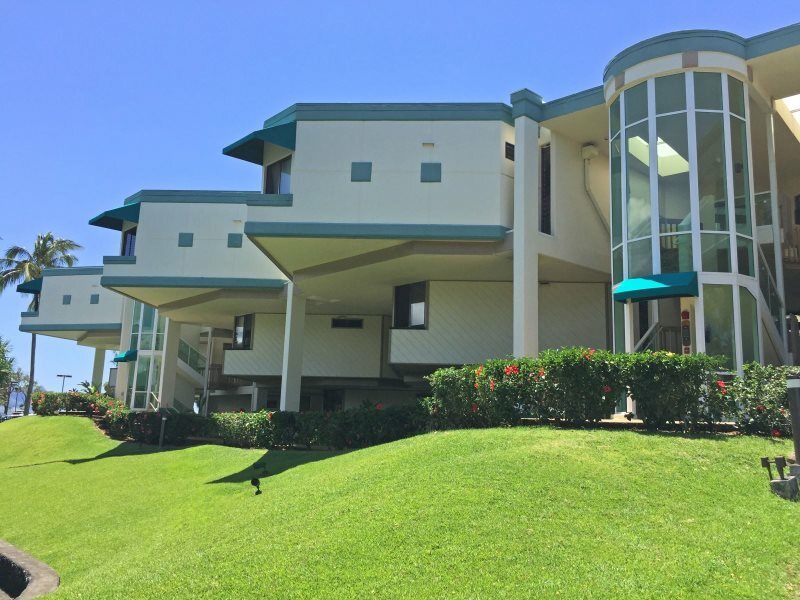 Right on the bluff with panoramic 180 degree views of coast and we saw whales every morning from our lanai and kitchen window. There's a good beach for snorkeling below the resort but you have to hike down about 5-10 minutes. Another good beach in front of St Regis, which is public and is easier to get to. 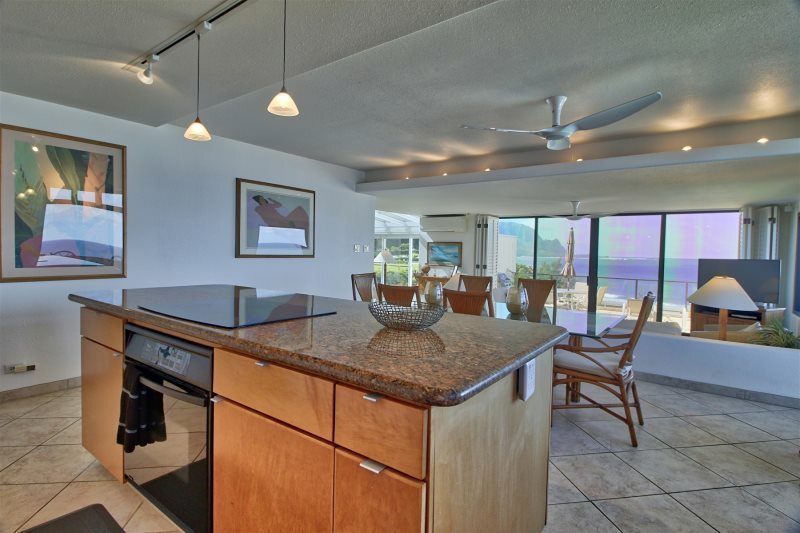 Condo was immaculate, well equipped kitchen, plenty of towels etc. 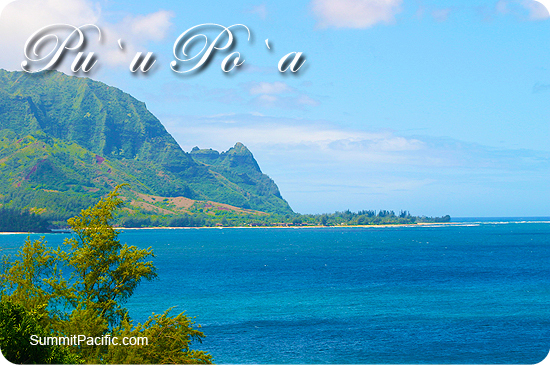 Kauai Pacific was very responsive, and all very helpful and friendly and we would definitely use this company again!